I found this video on YouTube of Space Mountain at Disneyland Paris. Be careful while watching...it is short but can make you motion sick if you are sensitive to such things. The sound is the best part. Listen to that thing rev up and then roar to full speed. This is not a kiddie roller coaster. NASA astronauts who have taken a ride say that the acceleration feels pretty close to a real rocket launch. Effrayant! 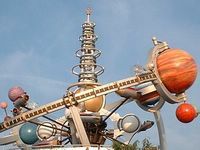 The Disneyland Paris Space Mountain is different than the American versions in Orlando and Anaheim. The ride takes its inspriation from Jules Verne and From the Earth to the Moon (De la terre à la lune), with rocket cars from the age of steam power rather than atomic power. The ride begins when you are "fired" out of a giant cannon: the same way the rocket capsule is launched in Verne's book. From there you roll and twist and hang on for dear life. Right outside the gilded towers of Space Mountain, the Jules Verne inspired submarine for Les Mystères du Nautilus lurks in a lagoon. You can read more about Disneyland Paris on the Re-Imagineering blog written by Disney and Pixar employees. Since Pixar was bought by Disney, there has been speculation what the impact will be on both companies. This blog is where employees from both companies share photos, ideas, complaints, and hopes for the Disney theme parks. Reading the thoughts of such creative people is a treat, with rare photos and artwork as a bonus. While I am at it...here's the outside of the Space Mountain in Paris. Secret space plane? Hold on there a minute! Blackstar - The secret spaceplane gets grounded?